Instructors can hide the box and whisker plot (grade distribution) graphs to keep students from viewing the summary statistics of the class and figuring out each others' grades. By default, the whisker graph is on. When the grade distribution graph is hidden, students cannot view any aspect of the graph, including the high, low, and mean scores. Note: Instructors can still view the grade distribution graphs even if they are hidden from students. 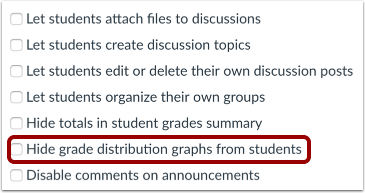 Check the Hide grade distribution graphs from students checkbox. Previous Topic:How do I hide totals in my students' grade summaries? Next Topic:How do I disable announcement replies for an entire course? Table of Contents > Settings > How do I hide grade distribution scoring details from students? It seems like hiding this should be the default. Thanks for your feedback! To suggest this change, you can create a feature idea. Here are a couple guides that will walk you through how to create a new feature idea and the feature idea process. I wanted to follow up and reiterate what Naomi said about creating a feature idea. If you have any further questions about Canvas functionality, please let us know. We're happy to help however we can. I would vote for it. I just had to hide the grade distributions graphs for most of the courses for one of our cohorts because a student complained that a few of her peers were making a habit of waiting outside of their classroom after exams with their laptops open watching as their classmates exited the room in an attempt to guess their grades. Now, I am fully aware that there are bigger fish to fry here, but the technology shouldn't provide these kids with a vehicle to bully others by default. Also, if a student could correctly calculate another student's grade we could be in violation of FERPA - along with any other school that has this feature turned on. I did some digging, it appears that feature ideas that have suggested hiding grade distribution scoring have since been pooled into the Allow Admin to Set Default Course Settings for Courses idea. You can add your voice to the idea by voting and adding comments. 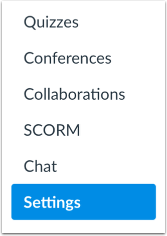 That would be a great place to brainstorm with other users and voice concerns regarding the visibility of grade distribution scoring. This idea is currently in our top 10% of ideas that have been voted on. If you have any other questions, please let us know! Re: Can the Average Score in Assignment Details be hidden from students?